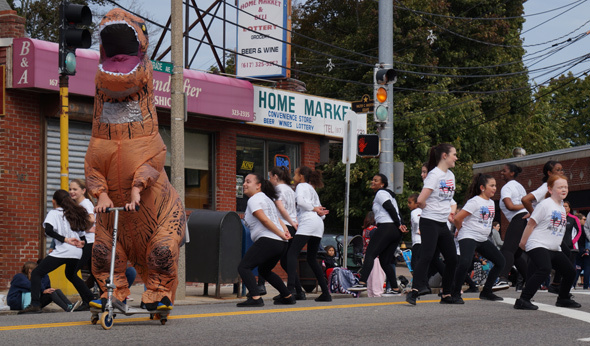 It was a perfect day for a parade in Roslindale. Some photos: Read more. 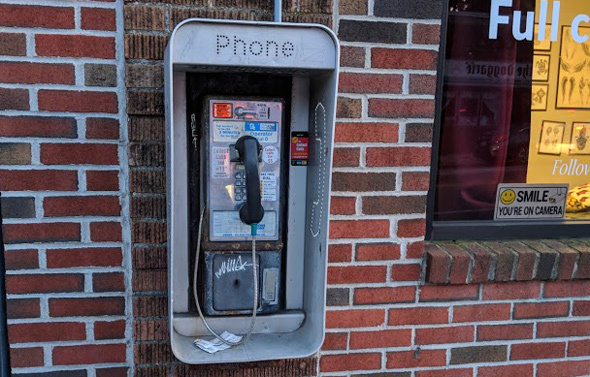 What appears to be a still functioning payphone remains mounted on the wall and trapped in time on Belgrade Avenue, near Walworth Street (we didn't try to make a call because neither of us had anybody we wanted to talk to at the moment). 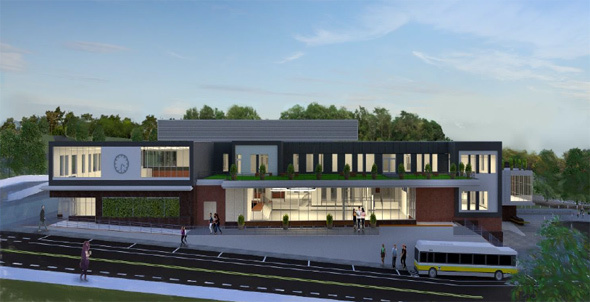 Roxbury Preparatory Charter School yesterday filed a "letter with intent" with the BPDA that signals it will soon file detailed plans to replace auto sales and repair buildings on Belgrade Avenue and West Roxbury Parkway with a three-story school for 800 students. Read more. The Boston Licensing Board next week hears requests from a brewery that wants to open in Roslindale Square and a convenience store that wants to start selling adult beverages on VFW Parkway. Read more. Mass Incident Paging reports the Cooperative Bank, 40 Belgrade Ave., was held up around 2:20 p.m. - and that a suspect was nabbed not long after a few blocks away on Roslindale Avenue at Haslet Street. 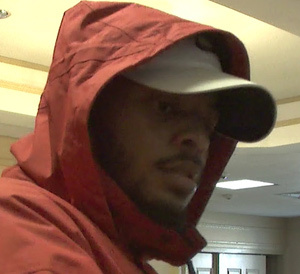 The bank had also been robbed on Feb. 21, by somebody who managed to run away. You do it! No, you do it! For years, the city of Boston and the MBTA have disagreed on who's responsible for the stretch of sidewalk and bus stop along Belgrade Avenue below the Roslindale Village commuter-rail parking lot. So, of course, nobody ever shovels it, at least until Roslindale residents call up and annoy City Hall enough that a councilor or somebody gets Public Works to send somebody down with a shovel (calls to the MBTA are, of course, useless, since nothing annoys the T). Looks like City Hall hasn't gotten enough phone calls over the past couple of days. The Cooperative Bank, 40 Belgrade Ave., was held up shortly after 11 a.m. yesterday. The FBI's Bank Robbery Task Force reports the suspect handed a teller a demand note, got money, ran away. If he looks familiar, contact Trooper Mike Hughes at 857-386-2580. Home Market, 165 Belgrade Ave., was held up at gunpoint around 9:30 p.m. by three black men, clad in blue and wearing black ski masks. Read more. This year marked a first for the venerable neighborhood parade - its official "mayor" had four legs - Rozzie the Dog, to be exact. Read more. The state Alcoholic Beverages Control Commission has ordered Home Market, 165 Belgrade Ave., in Roslindale, to close Aug. 2, 3 and 4 as punishment for letting a 17-year-old with a fake Maryland driver's license walk out with an 18-pack of Bud Light, a six-pack of Smirnoff Ice, a six-pack of Twisted Tea and a 25-oz. can of Natural Ice one afternoon this past January. Read more. Chris Lin, who opened Seven Star Street Bistro on Belgrade Avenue with his wife Michelle six years ago, posts today that they're closing the restaurant down. Read more. The Board of Appeal voted today to let developers John Morrissey and Michael Forde replace a vacant stretch of stores on Belgrade Avenue near the Bellevue commuter-rail stop with a four-story building that will house 21 apartments, first-floor retail space and 24 underground parking spaces. Read more. The Boston Licensing Board next week holds a hearing on Seven Star Street Bistro's request for a license that would let patrons bring their own beer or wine to drink with their meals. Read more. The BPDA board yesterday approved a four-story, 21-unit apartment building at 317 Belgrade Ave., next to the Bellevue stop on the Needham Line. John Morrissey and Michael Forde's proposal, which would also include first-floor retail space, now goes before the Zoning Board of Appeals. Read more. The city Office of Neighborhood Services holds a meeting on Roxbury Prep's proposal to replace the Clay auto facility at 361 Belgrade Ave. with a 750-student high school. The session begins at 6:30 p.m. in the meeting room at District E-5 on Centre Street in West Roxbury.